ENCINITAS — A group of residents is urging the city to reconsider plans for a large, concrete staircase at Beacon’s Beach to supplement, and ultimately replace, the iconic switchback staircase beachgoers currently use. The group, called “Preserve Beacon’s,” has mounted a petition drive and campaign in advance of the July 19 Planning Commission consideration of a coastal development permit for the proposed staircase. 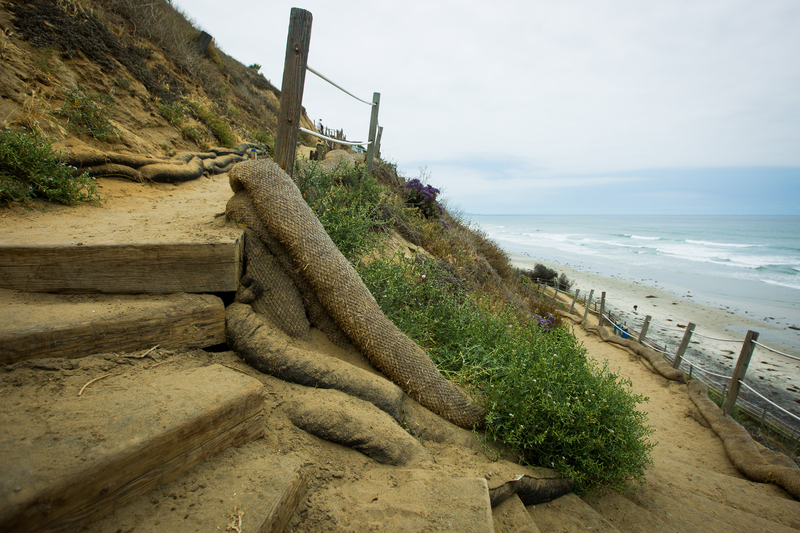 Encinitas has been grappling with how to fix the unstable coastal bluff that threatens the switchback staircase and the parking lot atop the coastal bluff at the beach. After its initial attempts failed to pass muster with the California Coastal Commission and Department of State Parks, city staff in 2017 emerged with a plan to relocate the parking lot further landward and build a new staircase to replace the iconic switchback staircase with one similar to those at Grandview and Swami’s beaches. The City Council approved as part of its 2018-19 budget $4.15 million for the project — $750,000 for engineering and the balance for construction. City officials hope to break ground on the project by October. But the group of residents said the proposed concrete staircase would irreparably alter the beach’s character by compromising beach availability, block lifeguard tower views, obstruct scenic views and make the beach less safe for families. The group argues that there are less intrusive alternatives to the concrete staircase, and is urging the city to go back to the drawing board. Pete Brately, who is spearheading the opposition, said that he believes the city hasn’t been transparent with the project, and that public input on the project to date has been minimal. The group also claims that the city has falsely claimed that the project has the blessing of the Surfrider Foundation. It cites an email exchange with Rick Wilson, a retired Surfrider staff scientist who served as interim policy manager while Julia Chunn-Heer was on maternity leave. Wilson said that the agency advocated for a staircase that would blend with the topography and would have wooden stairs. Chunn-Heer, reached July 11, said that the foundation in 2014 took a position supporting a staircase as opposed to the city’s then preferred alternative, an erodible soil buttress. The stability of the bluffs atop Beacon’s Beach, which is operated by the city under a 20-year agreement with state parks, drew attention in town after the 2001 collapse. City officials have long listed the stabilization project as a priority, and shortly after the 2001 incident state parks awarded the city a $2.75 million grant to stabilize the area. City officials in 2009 honed in on a seawall as the preferred method to shore up the bluff, but the state withdrew the grant, citing its policy against sea walls. The Coast News will be following up the story next week with more details on the opposition group’s alternative suggestions.